On the surface, Hime is the perfect high school girl – cute, friendly and kind to everyone. But it’s actually all an act, she’s merely become so good at creating a façade of picture-perfect sweetness that no one can see through it, and she plans to keep it up until she bags herself a rich husband. However, one day she accidentally bumps into a girl named Mai, causing her to trip and break her wrist. So, to make up for her mistake, Hime is forced to cover shifts at the café that Mai works at, an all-female café where the staff pretend to be students at a private school for the prim and proper. Then Hime meets Mitsuki Ayanokouji, the most graceful of the girls, and who seemingly does not take a liking to Hime at all; can Hime convince her with her cutesy act or is her façade finally starting to crack? The lead may look like Taiga from Toradora but their characters are certainly not the same; whilst Taiga is a ‘harsh’ type of tsundere (brash and rude on the outside, softer on the inside) Hime has these character elements in reverse: she appears to be the sweetest and cutest in her school, but actually hides a more cynical and driven personality. However, you never truly get the impression that she is a bad person or outright cruel. Whilst there are panels in which Hime’s inner voice is painted in a darker light, she doesn’t use her image of perfection to manipulate people into doing her favours or letting her off chores, it’s mostly for her own benefit, because she thinks it’ll make her look more appealing to a future rich man. This twist on the stock character type is thought-provoking to watch unfold, as it says a lot about her how her mind works and lack of self-worth. This is not explored very deeply here but it could lead to potential interesting plot developments down the road. Opposite her we have Mitsuki, who ironically also presents herself as the perfect student but in a different context; within the role she plays at her job , she’s one of the most elegant ladies, but lets Hime know behind closed doors that she does not like her whatsoever, which is something that Hime REALLY struggles with. The pair have an unusual dynamic in that they pretend to like each other in front of the crowd, with Hime trying her best to make it a reality, but it seems to get more fractured as the book progresses. As the working days tick by, this makes for a fun read because it’s a different take on the ‘enemies to lovers’ trope that has come before. For each funny conflict they have, we are rewarded with one or two fleeting but tender scenes. When we get the twist in the last chapter of the book as to why Mitsuki doesn’t like Hime, although you can see it coming from a mile away, it also makes you want to go back and re-read the opening chapters to see how they interacted before with this new context. The back cover advertises this title as being published in the same Japanese magazine that also brought us Citrus, however if you’re expecting this series to be something like that or perhaps NTR: Netsuzou Trap, you’ll be disappointed. Despite its blatant title, Yuri is My Job! is a slow burn series, as it should be, considering the clashing personalities of the female leads. That doesn’t mean there isn’t any fan service but it’s of the non-sexual variety and, like the host club in Ouran High School Host Club, the panels with the intimate scenes are set within the space and context of the café environment, meaning it’s to sell an image to their customers, not anything real. But that doesn’t mean it isn’t well drawn fake-fan service, as it’s full of flowery borders and sparkles to really sell the sparse moments. It also helps that the café employees all have good chemistry and complementary personalities, so the comedy and conversations flow naturally. Miman provides the art and story for this series; she has a nearly ten years of yuri and shojo manga writing experience under her belt, but this is actually the first volume that’s been translated into English so we can’t really compare this series to her previous work. Her art style is smooth, detailed and very pretty to look at, with each character design being distinct and easy on the eye. The only major flaw is the establishing of the environment; there are lots of scenes in which the girls serve the customers, or perform in front of a certain window, but you never get a sense of what the whole café actually looks like or the layout of it, all the scenes feel separate and backgrounds are unconnected. It would be nice if Miman gives us a full look at the settings in a future volume (the ongoing series is up to Volume 4 in Japan). This series is brought to us by Kodansha Comics, who kindly provide some nice translation notes at the back, as well as a translated café menu (as the items are mostly in German) and a handful of colour pages too. Overall a very well-presented book! Yuri is My Job! may not be as intense or romantic as some of the more recent yuri anime we’ve had this past twelve months but it’s a quirky, fun comedy series. It’s a strong first volume that sets up the premise and characters very well, and sows the seeds for lots of interesting conflicts in the future. If you’re a yuri fan, or perhaps interested in getting into it but not sure where to start, this book is worth picking up. 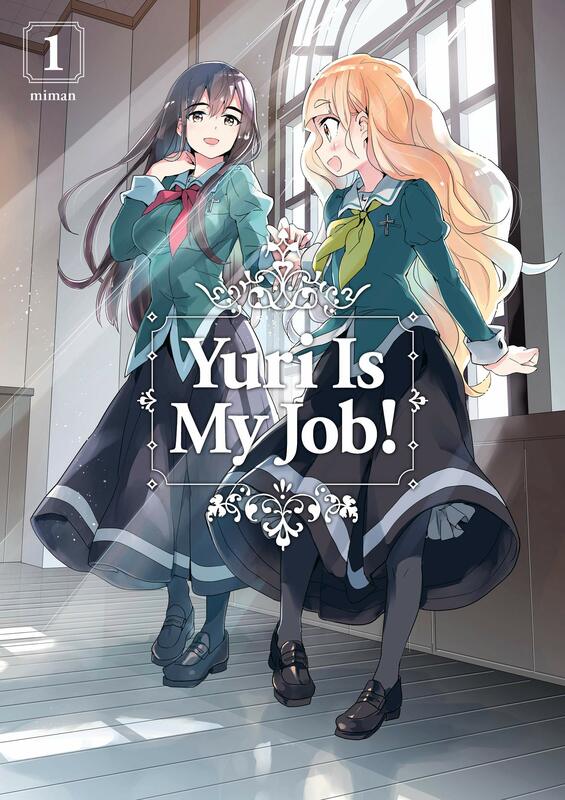 Find out more about Yuri is My Job! at Kodansha Comics here. Volume 2 of Yuri Is My Job! continues the story strongly by allowing events and relationships to progress naturally rather than trying to stretch the clichés to ridiculous extremes. While Otome Mania!! might not be a particularly realistic look at the games industry, it’s still an interesting story with a fun cast of characters. If you’re looking for a shojo series set within the world of otome game development, then this book will be perfect for you. The first volume of Cardcaptor Sakura: Clear Card Arc is a delightful success; from the lovely art and the characters to the new story’s beginnings – all of it feels like a genuine continuation that CLAMP wanted and felt creatively compelled to do. If you’re a CLAMP fan, do not hesitate to pick up this volume.